Ten miles run in training and my race number has arrived. It’s all getting very real as I prepare to run 13.1 miles on the Great North Run, supporting Cancer Research UK and some very special running pals. Sorry I haven’t bogged much about running and training recently. In fact there are at least two races and one big cycle ride that I never got round to writing about. I’m still very much in training though and enjoying the opportunities that bright summer days give me to get out and run or cycle. My last triathlon was the QE2 sprint triathlon at Woodhorn Colliery on 17 July. It’s a really good, well organised event. I enjoyed it, even though I knew, coming out of the swim that I wasn’t going to be breaking any records that day. A windy bike course and stopping to pass another girl my spare inner tube slowed me down, but actually helped me get the right mindset, which was about having fun and completing the lovely course. Since then I’ve been ramping up my run training as I’m doing the Great North Run, half marathon again this year. I normally give myself about 12 weeks training to pick up from running 10k to running 13.1 miles, but this year, I’ve only allowed myself seven weeks. So I’ve been running three times a week and doing some strength or body weight training on two days and trying to get a rest day in too. I’m enjoying running early in the mornings again, getting the best of the day as I head out from the coast. 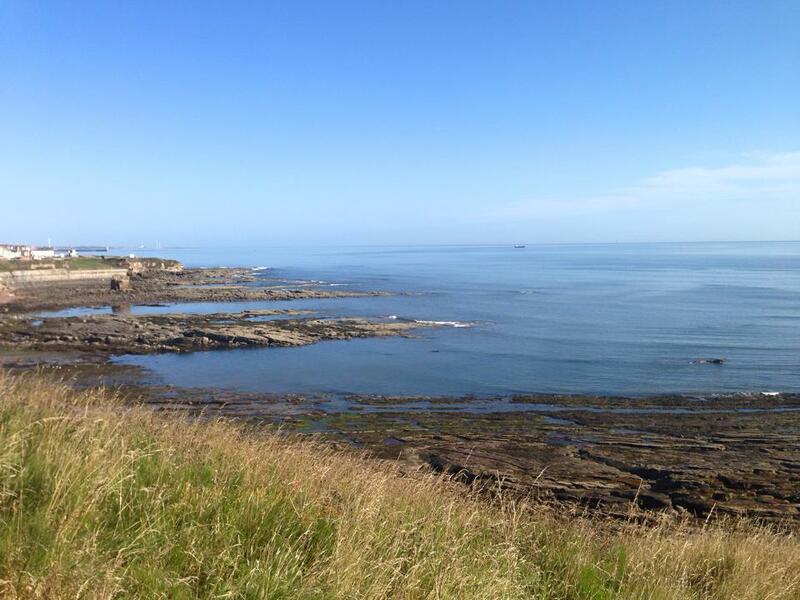 Today I managed 10 miles along the North East coast, with beautiful views over the sea. I’ve also been fortunate enough to combine my professional and running interests as I’ve been writing lots of content for my company blog, as there’s a large team of us taking part. My race number arrived this week, so suddenly it all seems very real. But my approach is very much to just get round and enjoy it. It’s not my target race this year and I din’t have a target time. I’d rather not put the pressure on myself and just enjoy the atmosphere of the day. I hadn’t really intended to run for charity this year, as I feel I’ve been so well supported in previous charity fundraising efforts. But the team is supporting Cancer Research UK and I’ve got got good reasons for supporting their work. When I was a teenager, my mum’s best friend had cancer. It was very scary at the time to think that someone like my mum could die from the disease and leave a young family behind. In the past year or so I’ve known three lovely and very active people who have died of cancer. A couple I knew through the online running community Fetch Everyone. Sue lived in Devon and loved surfing, skiing and ice cream as well as running. Jane is someone I’ve raced a triathlon with, so I was very sad to hear that her partner Alistair, another triathlete, had cancer. And then there was Zoe, the wife of Stephen, who I got to know online as we were both fundraising and running for Sands. She was an enthusiastic parkrunner, an Olympic torch bearer and Gamesmaker. They all leave family and friends who will remember and miss them always. In the past 40 years, survival rates for cancer have improved enormously, thanks to the work that Cancer Research and other organisations do. But It’s still very hard to accept that it can take such fit, active and outwardly healthy people, so young. I know that being fit, healthy and active and not smoking is about the best insurance I can give myself against cancer. And really it’s a privilege to be able to run and bike and swim and enjoy spending time outdoors as I do. So I’m running for Auntie Alison, Sue, Alistair and Zoe and all the others who would have loved to have run just one more race.